This property was originally known under the name of Montalis as far back as 1602, when Mathurin Baudoin, lord of the noble houses of Bosc (Nairac), Luziès and Montalis (Prost), paid tribute to the Duc d'Epernon. The noble house of Montalis, with its vineyards, winery and wine store house subsequently passed from one family to another by inheritance or sales. It was purchased after the French Revolution by Mr Prost who renamed it after himself. Later the Boireau family was owner for over a century and a half. 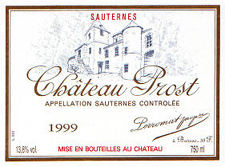 When Jean Perromat inherited Château Luziés , he decided to acquire Château Prost and its vineyard in 1965. Just in front of Chateau Nairac and Chateau Luzies , the vineyard is located on an old terrace near the church overlooking the Garonne.In 1855, and in the Edouard Féret's book on Bordeaux and its wines, Prost (Montalis ) was classified as "cru bourgeois superieur".